You are certain to stay warm and comfortable in this Blue Trench Coat that has stunning features such as double pockets, wide notch lapel and solid stitching. No matter what magic is afoot. this coat will get you ready for any adventure! After the last chapter of Wizardly world of Harry Potter, fans were thinking whether there ever be a sequel to the franchise! The answer came but in a form of reboot that takes us to a different universe featuring a new protagonist from the magical school of thought. The story takes place in 1926 during the time when the world was preparing for a disrupted war that was creating chaos. At that same time, Newt Scamander was in New York exploring the city to recover the creatures that were opened by a muggle. The passionate young adventurer took extra move forward which he describes in his own words was something more than a school teacher. 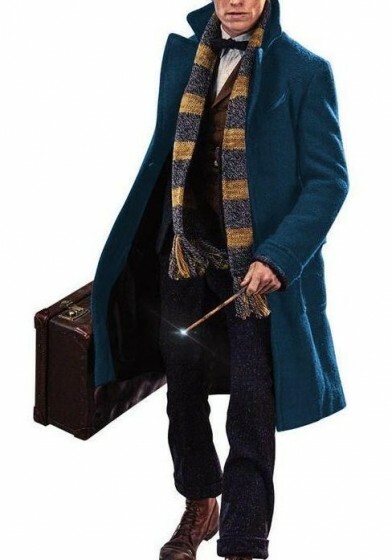 What many of us are unaware that the thin blue-eyed wizard is not just capable of casting magic from his wand but also an inspiring figure to cosplay. 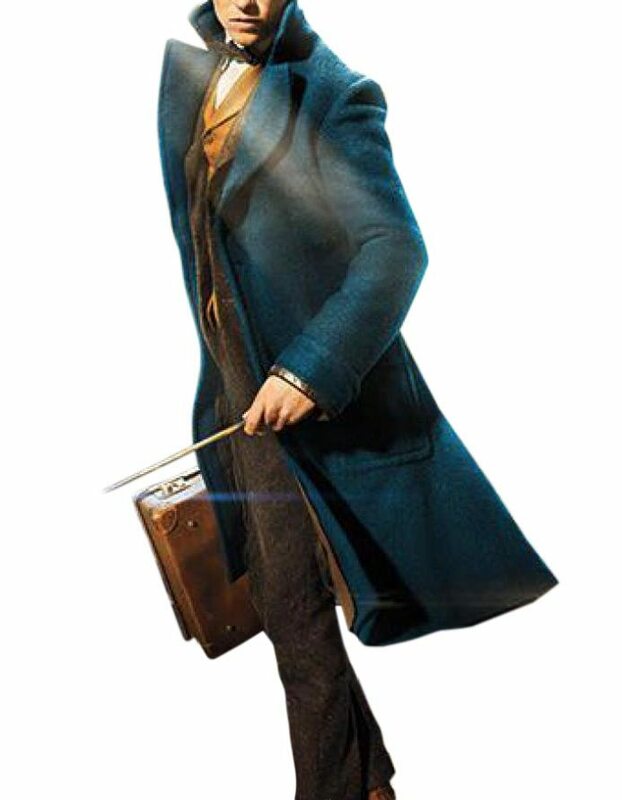 Now you too can pursuit your magical journey in the Fantastic Beasts Coat designed by Fjackets featuring screen-accurate properties and finished in a quality wool fabric. The iconic piece is a must-have for fans willing to take the role of the magizoologist or fight the cold during winter. From the durable construction, detailing texture to functional pockets, it’s a staple in the men’s wardrobe. The magical forces won’t mind you donning the contemporary fashion. Shop now and enjoy the fab look without breaking the bank. Also, see our similar design Fantastic Beast: Crimes of the Grindelwald Grey Coat. The coat is well made and as described online, in terms of length, colour and fit. 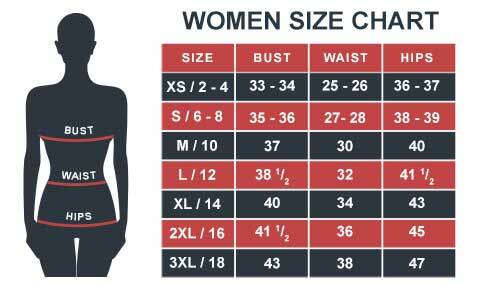 Take care in checking your size measurements required before ordering. Once dispatched the order was shipped by courier service and arrived quickly. All in all very good service. The jacket is great fits nicely and shipped here very quickly. Really nice quality and there are more pockets than what's listed. When I put my hands to feel the pockets, my heart almost sunk when I felt extra space. I found out that there is much more depth in it. It’s pretty neat considering the papers I can roll up and keep inside especially forms that can't afford to be crumpled. I was offering to pay more for the expedited shipping, but they refused. With being only a day late than the time I wanted it to reach, I had to give it four stars. Based on the description given I thought I would be receiving a coat that was a 90% replica of the coat found in the movie. To some cosplayers that can be a deal breaker, not for me, I placed my order straight away and couldn't wait until its arrival. When the parcel arrived, much to my astonishment, I found that not only was it an EXACT replica from the film but it also had a few extra gems that the description didn't state such as the black patch on top of the pockets. The coat is amazing! Well worth the price and I can't wait to get my Fantastic Beasts cosplay off the ground. Thank you thank you thank you! I will definitely be considering this site for all my cosplay jacket needs, which will be many. I have received my parcel before expected time. I ordered it for my brother and he really adores the gift. It fits him really well. The coat is nicely made with a unique color selection. I love what I purchased for him. He wore it in his annual college function. It’s been a pleasure to have this coat available before the movie release. The color is incredibly unremarkable. I am desperate to wear Eddie’s coat in movie premier.